Moist to wet ground generally: marshes, swales, ditches, and shores; swamps, shrub thickets, shaded borders, rarely in drier sites, and very uncommon northwards. Sometimes confused with C. scoparia, especially when immature. The pistillate scales are usually ± blunt and hyaline-tipped, while in C. scoparia they tend to be narrowly acuminate to very sharp tips. The leaves are generally narrower in C. scoparia. Depauperate shade forms with sparse and sometimes lax inflorescences are difficult to distinguish from C. projecta, and narrow leaved plants generally are hard to key because of the difficulty of discerning the loose sheaths. See the notes under C. cristatella. MICHIGAN FLORA ONLINE. A. A. Reznicek, E. G. Voss, & B. S. Walters. February 2011. University of Michigan. Web. 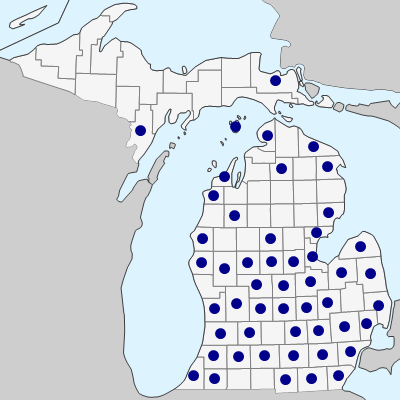 April 19, 2019. https://michiganflora.net/species.aspx?id=1069.